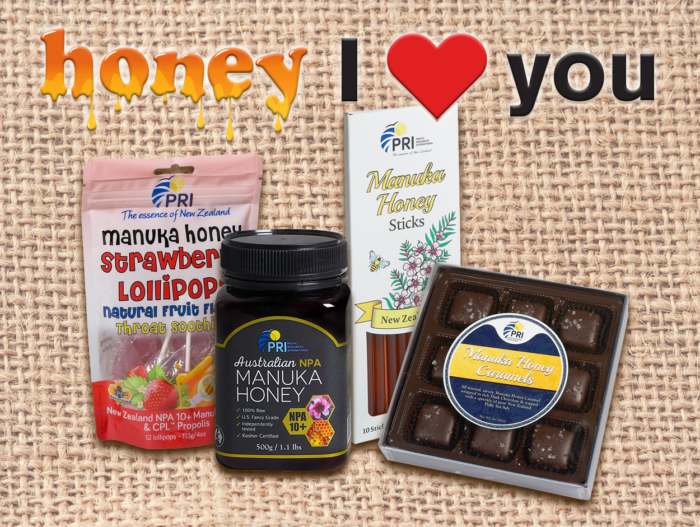 Honey I Love You Manuka Honey & PRI Prize Pack (arv $75)! Giveaway ends 02/20/18 at 11:59 pm ET! Open to US residents 18+ and older. I am most excited to try the chocolate salted caramels. I nam most interested in the Manuka honey. I love honey on biskets, as a sugar sub, and more. I am excited to try the Australian Manuka Honey 25+ , I have never tried this brand and I am always interested in trying new honey for its medicinal and anti-bacterial properties. The Dark Chocolate Salted Manuka Honey Caramels sound great. The lollipops. My kids would love them. I would love to try the Manuka honey itself. I love to add honey to my tea and what a great way to make it better for me. I am most excited to try the Dark Chocolate Salted Manuka Honey Caramels. I am most eager to try the Dark Chocolate Salted Manuka Honey Caramels. I'm excited for the Australian Manuka Honey. The dark chocolate salted honey caramels sound interesting to me. I do love the flavor of honey. I am most excited to try the Dark Chocolate Salted Manuka Honey Caramels,these sound simply delicious! In all honesty. I want to try them all. I was so excited to see this. Thank you for the chance to win. They have so many great products. the honey is my #1 choice to try........... This is very expensive honey and it sound so good so I want to try it really bad. The hone will be the first thing I would want to try because I have heard such great things about it. The Honey Sticks because they're new to me and it would be fun finding ways to use them! I most want to try the Dark Chocolate Salted Manuka Honey Caramels. I want the Strawberry Lollipops in my mouth. The strawberry lollipops look amazingly good. My first choice! I want to try the strawberry suckers, my son and I would both love them. I am excited to try the Dark Chocolate Salted Manuka Honey Caramels. the lollipops look so good! Either the honey (because I have yet to try it, OR the Dark Chocolate Salted Manuka Honey Caramels. The dark chocolate salted, sounds so good. i can't wait to try the dark chocolate salted manuka honey caramels. they sound really good. I am interested in trying the Manuka Honey Lip Balm. The caramels would be yummy. I want to try Manuka Honey Sticks. The Australian Manuka Honey 25+ sounds interesting! Love trying new products. I would love to try the Australian Manuka Honey 25+. I most want to try the Manuka Honey +25 (in my Earl Grey tea with some heavy cream). Iam really obsessed with lip balm... so the honey lip balm for me! I especially want to try the Dark Chocolate Salted Manuka Honey Caramels! I am excited to try the Manuka Honey Lip Balm. The Honey Caramels would be my choice! I want to try the Dark Chocolate Salted Manuka Honey Caramels. Dark Chocolate Salted Manuka Honey Caramels. The salted honey caramels sounds really good. I am most excited to try the honey - I'd love it for my tea and toast. The honey but they all look good. Id love to try the honey strawberry lollipops. They look awesome! I would like to try the Australian Manuka Honey 25+. I would love to win the honey for the health benefits. The lip balm and lollipops sound great too. I would like to try the Dark Chocolate Salted Manuka Honey Caramels. I am excited about the Manuka Honey Sticks. I'm excited to try the Dark Chocolate Salted Manuka Honey Caramels.